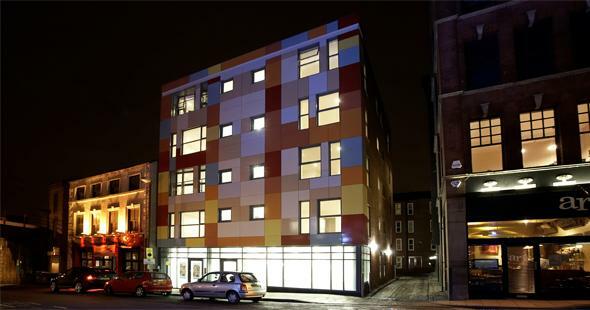 44-46 Call Lane is situated in one of Leeds most exciting and vibrant areas. It s certainly a great place to live if you want to keep in touch with the city s vibe This district is where you will find some of the city s hippest pubs and clubs. And because of its central location 44-46 Call Lane is the perfect choice for any busy professional. It offers all of the sights and sounds of the city at a surprisingly realistic price. The Technicolor exterior of 44-46 Call Lane would create a dramatic impression in any location but because it has been positioned between some of Leeds best examples of historic architecture the effect is especially stunning Think Lego bricks amongst clay and you have some idea of what is going on with this apartment block With its glass-fronted balconies and brightly decorated facade this building is perfectly at home in one of the most colourful areas of Leeds city centre.